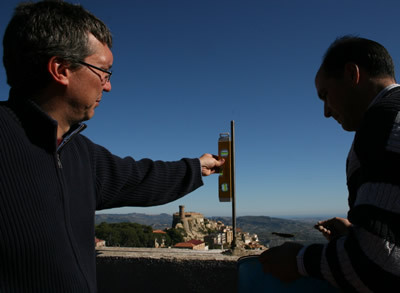 Participants from the Lamont-Doherty Earth Observatory, Dalhousie University, Universita della Calabria, and the UNAVCO Facility installed nine continuous GPS sites on a transect across Calabria, Italy, in November 2006. Calabria , in the boot of Italy, lies over an active Benioff zone in a complex subduction system. The transect of GPS sites is part of a multi-institutional, multi-disciplinary study to determine subduction history and whether convergence here continues at present. The GPS campaign will last five years, reflecting increasing demands from UNAVCO users for long-term campaign deployments. Each site is equipped with a Trimble NetRS receiver and a Trimble Zephyr Geodetic antenna. Because of security, power, ease of installment, and cost, all sites were installed on buildings; 2 churches, 2 schools, 1 cross-country ski lodge, and 4 town halls were used. Most monuments are simply a 5/8” stainless steel all-thread pin epoxied or cemented into a hole drilled into the roof. However, several custom mounts were designed and used: To avoid excessive snow cover at the ski lodge, a side mount was used, and at Luzzi a taller monument was used to extend the antenna above a railing. All systems employ AC power with a battery back-up, and three are currently connected to local internet. 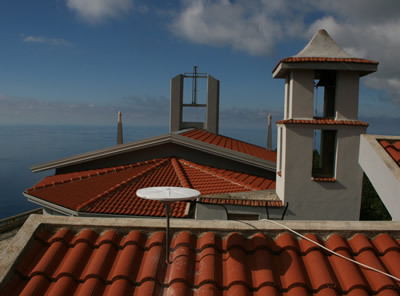 New GPS site at Cetraro, Calabria, overlooking the Tyrrhenian Sea. Mladen Nedimovic and a local contact install the monument post on the roof of a school, with a view of a medieval castle.